When your grandchildren ask where you were during the Great Bacon Wars of 2019, you can say you were housing a free pile of bacon fries. That's because Wendy's isn't done with the flame war it started. In late January, McDonald's launched a Bacon Happy Hour that allowed you to add bacon to any order for free. However, it only lasted an hour, so Wendy's couldn't resist one-upping the Golden Arches. They gave out free Baconator burgers for a week. Unable to stop poking the bear, Wendy's announced on Monday that it's launching a deal to give away free Baconator Fries with any purchase. You can redeem the offer once a day from February 11 through February 17. What are these fries? No, they aren't Arnold Schwarzenegger's favorite snack. 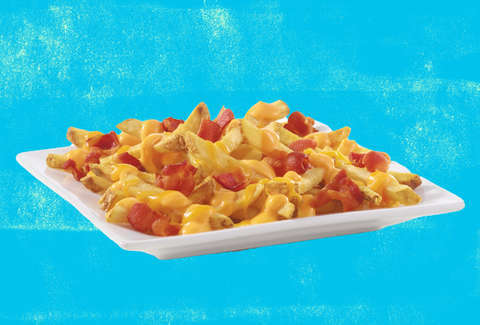 It's a tray of skin-on fries with salt, cheese sauce, shredded cheddar, and Applewood smoked bacon. Here's the deal: Make any purchase, and you can get a free order of Baconator Fries. You just have to download the app and find the deal under the "Offers" tab. It can be used in-restaurant and on mobile orders. You can grab 'em with any purchase at all. So, get a drink and grab free fries. Get a burger and, boom, free fries. Grab some fries and grab more free fries. You get the idea. Elsewhere in the app, you'll find deals like a buy-one-get-one-free chicken sandwich, $2 off a full salad or Premium Combo, and more. The Great Bacon Wars of 2019 are ridiculous, but it's worth enduring if you keep getting free food because of it.